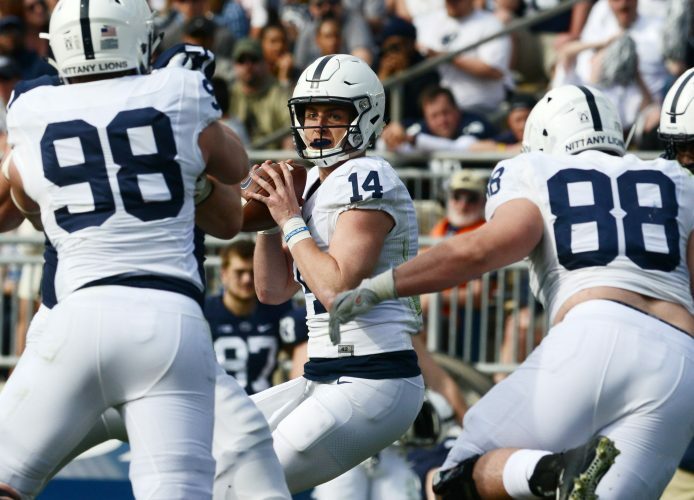 Quarterback A	McSorley went 32-of-41 for 342 and two TDs, and boy does he have the clutch gene. His 12-for-12 on third down for 192 yards is just amazing. Also ran for 60 yards on 12 carries. Best of all, he’s back for another year. Stevens caught three passes. Running back B+	Barkley got 25 touches — 18-137 on ground, including 92-yard TD, and seven catches for 38. Sanders got six carries for 15 and a TD and caught a pass but wasn’t ready for pitchout he fumbled. Offensive line A	Beleaguered group really came to play and, with four starters back, injected hope for 2018. Pass protected well — one sack in 41 dropbacks — and 203 net rushing against highly-regarded defense couldn’t have been expected. Wide receiver A	Position combined to catch 15 balls, which it will take any week. Hamilton (5-110, two TDs) led way and Johnson (6-66) has become go-to option over middle, taking big frame to first down marker and parking. Thompkins (2-39) made another gem. Tight end A	Gesicki (6-62) finished the season with 57 catches and 129 for career. Great at jump ball and as good underneath, he may be as tough to replace as Barkley since no other returning TE has more than three catches. Offensive coaching A	No one, not even Rahne, could have expected first non-JoeMo game to go better than it did. Spread field, got the many weapons involved and took blame for two turnovers — pitchout and deflected pass. Very encouraging. Defensive line A	Givens may have had best game with four stops and TFL. Miller emerged from doghouse with three stops and tweeted he’s sorry. Chavis, Gross-Mantos, Simmons had sacks. Toney benched for undisclosed indiscretion. Linebackers B	Smith led with seven stops and came up with game-sealing fumble. Got caught inside on 69-yard TD that cut it to 35-28. Cabinda added four tackles. He and Smith will both be missed as leaders. Secondary B	Tricked on trick play but other than that, gave up just 122 pass yards. Not bad given Browning was 2016 Heisman finalist. Allen led with seven stops. What a run stopper. Haley and Campbell had four tackles, Apke three. Defensive coaching B	Pry was aggressive in sending varied blitzes at Browning, and the strategy worked. No real superstar, maybe Allen, on this defense but it held up well, other than couple big plays. TD drive to open third quarter could have been better defended. Special teams C	At best fair. Davis went from automatic to PK who couldn’t be trusted, winding up season 9-for-17. Thompkins had trouble seeing the punts and early flub was nearly costly. Not sure about Sanders as KR, either. Gillikin real, coverage solid. The other guy C	Expected more out of Huskies. They committed penalties and were flat early but eventually showed ingenuity and fight in rallying from 28-7 deficit. Body of work in bowl games showed Big Ten has wide edge over Pac-12. Officials B	Big 12 crew, with Ed Hochuli gunned-up clone as white hat, seemed to get most calls right and didn’t overdo it. Just 42 yards total in flags — 4-22 vs. UW and 2-20 vs. Nits. Did miss a personal foul and borderline targeting against McSorley. Atmosphere B+	Would be higher but 10K shy of sellout. Shows challenge of filling stadiums for non-CFP games. Still, stadium is a gem. Couple with mountains, climate and hospitality, and it’s a winner. Overall B+	Controlled quality foe most of way. Could have finished stronger defensively but at least finished better than other games. Despite three turnovers and missed FG, offense had great game.